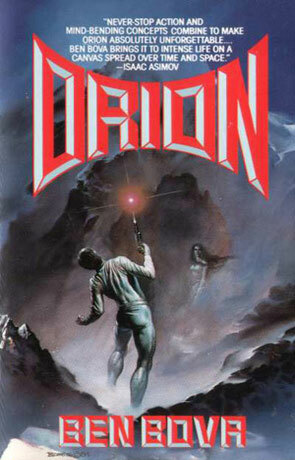 Orion is a time travel science fiction novel by Ben Bova. The idea is so neat, that this easily could have been one of my all time favourites. It's not, but I'll get back to that. Two warriors Orion, The Hunter, and Ahriman, The Dark One, travel from each end of time and meet at important points in human history. Ahriman travels forward in time and tries to destroy time and space and thereby humanity. Orion travels backwards and tries to stop Ahriman. The fact that they travel in different directions is a great idea – the first time Orion meets Ahriman (a bit into our future), Ahriman already knows Orion and has met him several times before and vice versa. During his travels Orion not only get different chances at stopping and ultimately killing Ahriman, he also gets some insights into his own existence and the history of mankind. Sounds great doesn't it? Well, it could have been, but Orion (the book) has a few problems, the biggest being that it's just not terrible well written. The cyclic nature of Orions travels and his musings over his own existence become rather repetitive after a while and the origin of Ahriman was far to easy to guess. Ahrimans origin comes as quite a surprise for Orion, but I had it guessed a thousand pages before (well, maybe not that many), which is quite a letdown in my opinion.